The damaging decline of our environment is undoubtedly a pressing concern. The rise in pollution, excess use of energy and our reliance on non-recyclable materials are just the tip of the proverbial iceberg. Whilst positive changes are being made, including supermarkets cutting down the use of plastic bags and the EU’s ban on non-biodegradable products, one area that’s often overlooked is the impact office buildings have on the environment. According to the Carbon Trust non-domestic and commercial buildings account for 18% of the UK’s carbon emissions. It’s a staggering figure, and while many of us are rightly concerned, the challenge is often viewed as too large, too complex, and if we’re honest, too inconvenient to fundamentally change the day-to-day actions that can negatively impact the world around us. However, facility managers can implement a variety of small, yet significant changes that can effectively make their buildings more environmentally friendly. Non-domestic and commercial buildings account for 18% of the UK’s carbon emissions. It’s also important to ensure all the lights are switched off after use, and for large facilities where a manual process isn’t feasible, simple lighting sensors that turn off the lights automatically can be a sensible first start. While budgetary restraints may make it difficult to install sensors in every room, by starting with rooms that are frequently unoccupied (and that often have their lights left on) you can start to minimize the impact of continually lighting low traffic areas. From 2016 to 2017, electricity generated by renewable energy sources increased by 5%, but primarily as a result of large, government funded initiatives. The next logical progression is how we adopt the technology and apply it on a smaller scale, with buildings generating enough energy so that they’re relatively self reliant. In a positive step, the UK’s first energy-positive classroom, designed with research expertise from Swansea University, generated more than one and a half times the energy it consumed, according to data from its first year of operation. The next phase of their research is to use similar construction methods, before applying the technology to an office building. Dubbed the ‘Active Office’, it will use a range of innovative technologies that will enable it to generate, store and release solar energy in one integrated system. While large scale adoption is still some years off, the point is that solar technology has come a long way in recent years, and while it would be great if every office building produced 100% of its own energy requirements, solar power can make a significant impact. Photovoltaic cells can also be installed in a variety of ways, including rooftops, building’s facade, or even installed in transparent modules in windows and skylights. While 70% of office waste is recyclable, on average only 7.5% reaches a recycling facility. Recycling is one of the most common methods to making a building environmentally friendly, however, Envirowise found that while 70% of office waste is recyclable, on average only 7.5% reaches a recycling facility. Every single year 80.6m tonnes of printing and writing paper enters the UK waste system, accounting for 24% of waste throughout the UK. 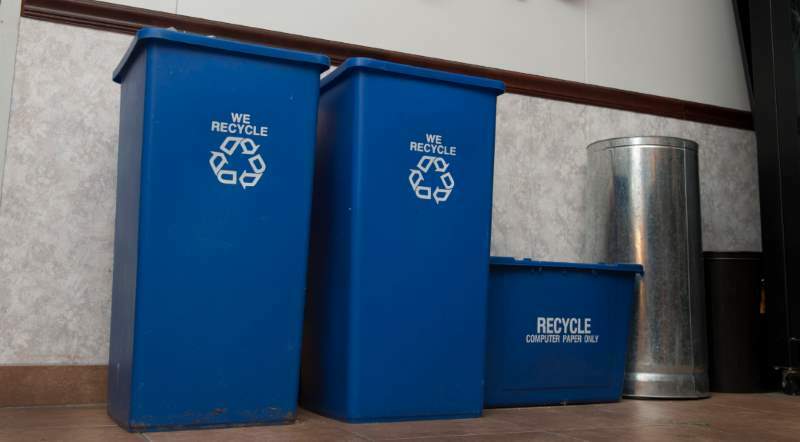 While it may seem simple, facility managers can ensure that by providing enough recycling bins throughout their building, waste is transported to the correct recycling facility. The impact can be significant, with recycling one tonne of paper per year can save 7,000 gallons of water, 17 trees, 380 gallons of oil, 4,000 kilowatts of energy and, three cubic yards of land space. Considering the average office worker uses 10,000 sheets of paper a year, having the correct bins located throughout an office or work environment, can, and most likely will make a significant impact. It’s understandable that buildings need to have a regulated temperature throughout the year, but there is a move away from traditional, energy intensive air conditioning systems. Eco-friendly air conditioning and heating systems have become an option for many buildings, harvesting the ambient heat energy from the external air and simply using the cooling cycle in reverse. These system works more efficiently because the process requires no electrical or gas burning element – and every 3kW heat energy created, only 1kW of electricity is used. However, during the summer months, there are also cool roofs and Electronic Smart Glass that can help to keep a building cool, reducing the expense of air conditioning even further. Cool roofs use a special reflective paint and tiles that reflect heat and sunlight, lowering the heat absorption and thermal emittance of a building. Put simply once installed, they cost nothing, emit zero emissions and help to keep a building cool during warm weather. Facility managers often have a tough job and need to keep up to date with every office in their building to ensure that everything is in working order. This can include things such as the lighting, air conditioning, locks, and even window blinds. Even the simple act of putting the air conditioning too high in the summer, or heating too high in the winter, can waste a lot of unused energy. It may sound simplistic, but small acts add up, and it’s important to ensure that everything is switched off. Whether that means doing a last check of all the electrics at the end of the day from each office, or putting up a sign in the office to say ‘switch everything off when not in use’, gentle reminders can help tenants or staff to take action. It’s very important women dispose of sanitary waste into the bins. With half the population actively disposing of sanitary products every month, it’s crucial to provide sanitary bins in your building and to comply with the UK’s sanitary bin legal requirements. It’s also important women dispose of sanitary waste into the bins. Flushing them down the toilets can often result in blocked drains, or they can end up in rivers or coastal waters. The Marine Conservation Society reported that sewage-related debris makes around 6% of Britain’s beach litter, and causes damage to wildlife and delicate ecosystems. It’s therefore important that facility managers not only provide sanitary bins in the women’s toilets, but ensure that correct disposal is encouraged, and that any waste is recycled appropriately. Author bio: Jo Greene is the Marketing Director of family run business VR Sani-Co, providing a range of quality washroom services and sanitary bins throughout London, Sussex and Kent.